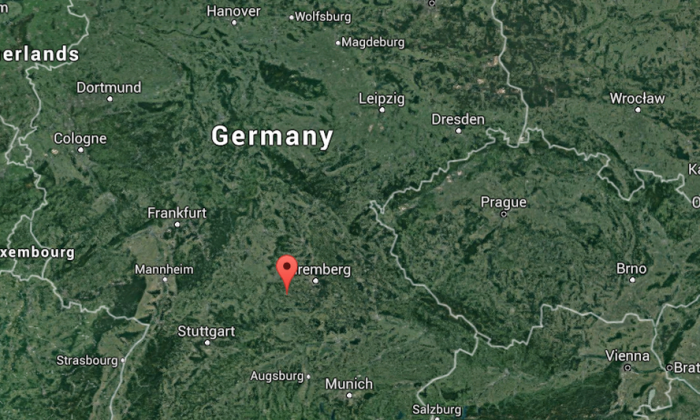 A large explosion has been reported in Ansbach, Germany, on Sunday, German media reports said. At least 10 people were injured. Michael Konrad, a Nuremberg police spokesman, said in local media reports that the blast is believed to have been intentional. The dead person is believed to have set off the explosion, he said. Police said that at least one person was killed and several were seriously injured, according to the Nürnberger Zeitung. The newspaper said the explosive device went off in front of the site of a three-day-long music festival. It’s unclear if the person who allegedly set off the explosion had ties to terrorism. “The explosion in the [city’s] downtown was not a gas explosion, but was caused by an explosive device,” the paper said. An Interior Ministry spokesman said it was a “deliberately provoked explosion,” the paper reported. The newspaper said a “large-scale” police operation is underway, including the deployment of a helicopter. The paper reported the explosion took place at a restaurant, called Eugene’s Wine Bar. A nearby music festival in the city has been canceled, the reports said. Volunteer firefighters from Katzwang and Almoshof were called in to assist. Ansbach, a city in the German state of Bavaria, is located about 25 miles southwest from Nuremberg. On Sunday, a Syrian refugee armed with a machete killed a pregnant woman in another city in Germany. Several people were injured, DW.com reported. “Thank God the police were immediately able to capture the suspect, neutralizing any danger,” Thomas Strobl, interior minister for the German state of Baden-Württemberg, told DW. Police said there’s no indication the Syrian man had connections to terrorism. In Munich on Friday, an 18-year-old Iranian-German man shot and killed nine people. And on Monday, an Afghan refugee injured several people with an axe on a train. He allegedly pledged allegiance to the ISIS terrorist group.